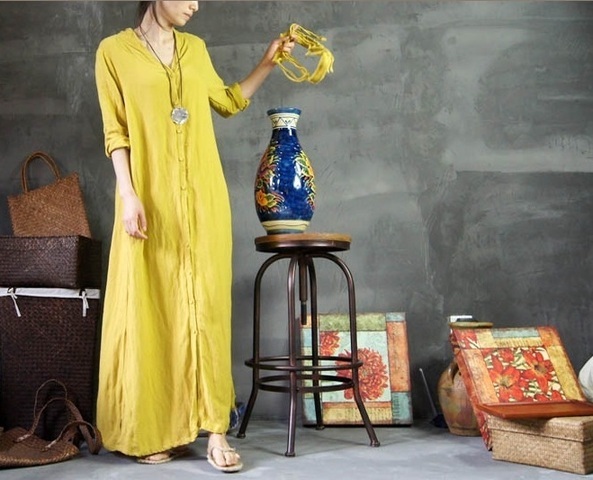 Beautiful eye catching long linen dresses in vibrant colors. Choose sleeveless empire waist or long sleeve gathered waist. Both styles availabel in Green White or Blue. Pre-shrunk, machine washable linen or dry clean. For best length measure top of shoulder to floor, 54" to 64" long. PLEASE NOTE: Size 16-18 will fit up to 46 inch hip; size 22 up to 50 inch hip. You’ll be catching kisses left and right when you strut your stuff in this beautiful extra long navy blue drape knit caftan dress! Full fit figure flattering, back is same as front. Machine washable stretch knit polyester. For best length measure top of shoulder to floor, up to 64" long. PLEASE NOTE: Size 16-18 will fit up to 46 inch hip; size 22 up to 50 inch hip. This caftan maxi dress is simply irresistible in every single way! Lightweight forms a loose fitting bodice with pockets and gathered front waist and scoop neckline. Perfect for any occasion! Color shown rust. Machine washable rayon blend. Measure shoulder to floor for best length, 57"-64" long. NOTE: Size 6-10 for up to 38" hip/chest; size 16 up to 44" hip/chest. Tall high fashion, loose fit scoop neckline with side satin trim long maxi tunic dress, long floor lengths available. For best length measure top of shoulder to floor, up to 64" long. Please NOTE: Size 16-18 will fit up to 46 inch hip. Shown Pink and Green. Machine washable rayon blend. Tall womens hi low maxi dress in floor length nightgowns. Great gift for yourself or loved one for travel or night out on the town. Pink or White shown above and black. For best length measure top of shoulder to floor. Machine washable rayon blend. (SM 37" hip & chest); (MD to 40" hip & chest);(LG 44" hip chest); (XL to 48" chest & hip); (20-22 to 50" chest & hip). Machine washable polyester lace trim and nylon. See "Long ROBES" . This lightweight sheer chiffon caftan has unique look with swirled ivory brown leopard print, modest scoop neckline, loose fitting pullover, no slits, non see through, fully lined in soft nylon. Extra length for tall women. Machine washable. Please Note: Size 14 up to 42" hip/chest; size 18 up to 46" hip/chest. Measure shoulder to floor for best length, up to 64" long. Feminine flattering choice for any occasion, detailed button front and fantastic colors to bring elegant beauty to all. You'll enjoy this romantic shirt style dress with long sleeves. Shown above in yellow cotton blend poly, machine washable. For best length measure top of shoulder to floor, up to 64" long. NOTE: Size 12-14 will fit up to 42 inch hip.